Here's how to get paid, and get paid faster. Please enter your email so we can send the pdf straight to your inbox. Most people in the construction industry are familiar with mechanics liens. But did you know that a mechanics lien is not a standalone document? In most states, you must take preliminary steps before filing a lien. Additionally, these preliminary steps are often enough to get you paid without ever needing to file a lien. 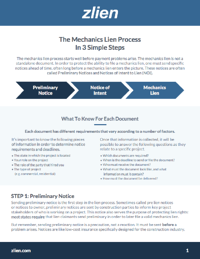 Our attorneys wrote a 2-page guide to help you navigate the mechanics lien process and secure payment on every project. To download the guide, just submit the your info to the right.